I was inspired by a recipe I saw on Pinterest for a lower calorie/fat Alfredo sauce but then of course I changed it all around 😉 Wouldn’t be me if I didn’t! I left out the bacon, used a little less cheese, cooked a roux – not the same I know but it turned out delicious – I followed my concept of how a flour based recipe should be prepared and not their directions. It was well received, much that the toddler ate two plateful, which was shocking. I used farfalle (bowtie) pasta, any shape will work as will fettuccine noodles. Bowties work well for toddlers though, they can grab them with their fingers. Bring a large pot of water to a boil, add the pasta and cook for time on package. Add the chopped spinach to a large colander, pour the pasta and water over it. Meanwhile in a large non-stick skillet, heat over medium heat and add the oil and garlic, cook for a minute till fragrant. Whisk in the flour and let cook for a couple of minutes (it will be crumbly). Whisk in the broth, working any lumps out, then add the cream cheese, whisking till smooth. Turn down to medium-low, add in the milk and pepper, whisking again till smooth. Add in the cheese. 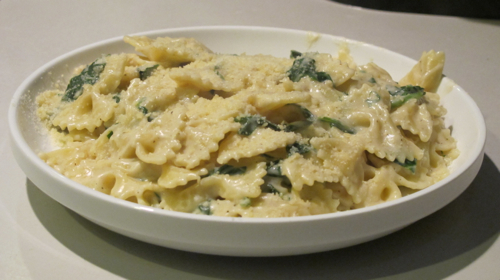 Toss with the hot pasta and wilted spinach. Serve with more cheese if desired.